Welcome to the Plazma Burst 2 Level Editor Manual. This manual will describe all the basic tools of the Level Editor, It's identities and purposes. Key filtering - the ability of "interface element" to act as a different tool in case when Ctrl, Alt and Shift keys being hold during mouse click. Usually Ctrl key will mean "Add", "Alt" key will mean "Exclude", "Shift" key will mean "Next object". Map ID - unique map identification. Your map ID is what players use to play your map in-game. Map ID - displays the map ID of your map that you are currently working on. Save Map - saves your map. Save Map as - saves map with the ability to specify a new name. Revert Map - cancels all the changes made after the last "Save Map" was made. New Map - create a new map that you can work on. Open Map - open one of previously saved maps. Play as tester - test a map before it's published. Rights - displays rights which you have on specific map. 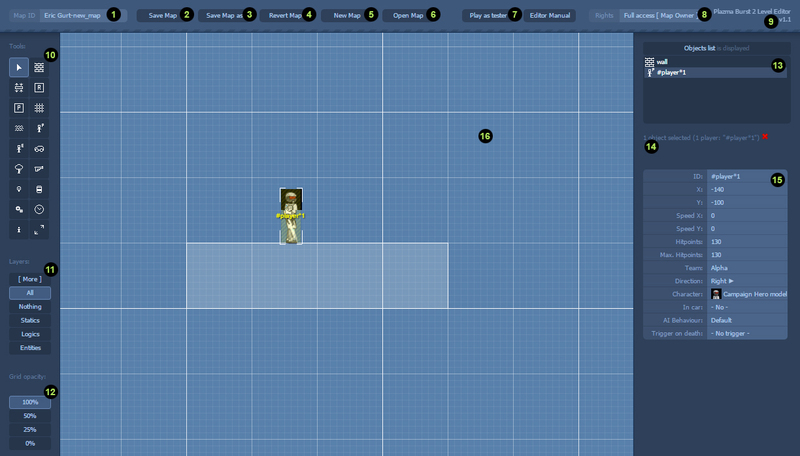 Level Editor version info - displays the current Level Editor version. Tools - a list of available tools for map editing. Layers - allows to disable a specific "object(s) layers" from being accidentally edited. Grid opactity - toggle to see how much of the grid is visible. Objects list - displays all of the objects on specific layer. This list supports Key filtering. Selected objects info - lists all selected objects at the moment. "Red X" will cancel a selection. Selected object's parameters - lists all parameters of your selected objects. You can edit them. Map blueprint - here you can work with objects on your map or create them. Selected objects are marked with the color "yellow". Supports Key filtering, left mouse button, right mouse button, mouse wheel. Here is short description about what tools you can use. FreeEdit tool - allows you to select, deselect, move, scale objects. Supports Key filtering features. Add a Wall - allows you to create wall objects. Drag to specify the size. Add a Movale object - allows you to create a Movable object or objects. Drag to specify the size. Add a Region - allows you to create Region objects. Drag to specify the size. Add a Pushing area - allows you to create Pushing area objects. Drag to specify the size. Add a Background - allows you to create Background objects. Drag to specify the size. Add a Water area - allows you to create Water area objects. Drag to specify the size. Add a Player - allows you to create Player objects. Add an Enemy - allows you to create Enemy objects. Add a Vehicle - allows you to create Vehicle objects. Add Decoration - allows you to create Decoration objects. Add a Gun - allows you to create Gun objects. Add a Lamp - allows you to create Lamp objects. Add a Barrel - allows you to create Barrel objects. Add a Trigger - allows you to create Trigger objects. Add a Timer - allows you to create Timer objects. Add an Engine mark - allows you to create Engine mark objects. Add Song - allows you to create custom song objects that can be played using triggers. Might be able to download music only from limited list of domains, such as https://freemusicarchive.org (URL must be the track page URL, not file download link). Make sure to mention song author in level description or map credits. SelectionScale tool - allows you to scale selected objects. - With the Plazma Burst 2 engine, "Crate's" and "Rope" objects are "Vehicles". - With the Plazma Burst 2 engine, "Allies" are "Enemies" unless are on the same team as active Player. - Player and Enemy objects will not collide if their team is set to "Alpha". - In the Plazma Burst 2 engine, the Lamp flare effect can be disabled. - Some of Decorations will automatically generate a glowing effect with the help of "Lamp object" with the flare effect disabled. - None of Decorations collide. Their collision can be made with the help of invisible Movable object(s). - The "Pushing area" other than it can "push an object" it can also deal 2 kinds of damage: basic and slicing. - The "Killing ray Decorations" deal no damage by default. Their damage can be created with the help of "Pushing areas" with slicing damage enabled. - With the Plazma Burst 2 engine, Acid is Water with damage turned on. - "Background objects" are just the background walls. To change the sky texture use the "Engine mark" object. - "Shadow's" are generated only over Background objects. - With the Plazma Burst 2 engine, it automatically generates Lamps with the disabled flare effect around the Background objects with the brightness based on the current sky texture to generate the global illumination. - "Shadow's" in a map's appearance is based on the game settings. - Enemy object skills are based on the "difficulty level" which is selected by player. In multiplayer, the difficulty level is always "Impossible". - Manipulation of the gameplay and the level appearance can be done with help of Engine mark object(s). Right mouse click drag / mouse wheen click drag - Pan. Wheel up - zoom in. Wheel down - zoom out. Left mouse click drag over selection - move selected objects (can be combinated with WSAD screen control). Left mouse click drag over edge of selected resizable object - resize selected object (can be combinated with WSAD screen control). Left mouse click drag - selection region drag (can be combinated with WSAD screen control). Ctrl + Left mouse click drag - add objects to selection by dragging selection region (can be combinated with WSAD screen control). Alt + Left mouse click drag - substract objects from selection by dragging selection region (can be combinated with WSAD screen control). Shift + Left mouse click drag over selection - select object behind selected object. Ctrl + Z - undo. Ctrl + Y - redo. Delete / Backspace - delete selected objects. H - mirrors selected objects horizontally. V - mirrors selected objects vertically. W/S/A/D - move screen in 4 directions (can be mentioned as WSAD screen control). Shift + W/S/A/D - move screen in 4 directions faster. Q - toggle additonal panels auto-hide. Ctrl + C - copy selected objects to "Primary" clipboard. Ctrl + V - paste objects from "Primary" clipboard. Ctrl + 1 - copy selected objects to "Secondary 1" clipboard. Ctrl + 2 - copy selected objects to "Secondary 2" clipboard. Ctrl + 3 - copy selected objects to "Secondary 3" clipboard. Ctrl + 4 - copy selected objects to "Secondary 4" clipboard. Ctrl + 5 - copy selected objects to "Secondary 5" clipboard. Ctrl + 6 - copy selected objects to "Secondary 6" clipboard. Ctrl + 7 - copy selected objects to "Secondary 7" clipboard. Ctrl + 8 - copy selected objects to "Secondary 8" clipboard. Ctrl + 9 - copy selected objects to "Secondary 9" clipboard. Ctrl + 0 - copy selected objects to "Secondary 0" clipboard. 1 - paste objects from "Secondary 1" clipboard. 2 - paste objects from "Secondary 2" clipboard. 3 - paste objects from "Secondary 3" clipboard. 4 - paste objects from "Secondary 4" clipboard. 5 - paste objects from "Secondary 5" clipboard. 6 - paste objects from "Secondary 6" clipboard. 7 - paste objects from "Secondary 7" clipboard. 8 - paste objects from "Secondary 8" clipboard. 9 - paste objects from "Secondary 9" clipboard. 0 - paste objects from "Secondary 0" clipboard. More info might appear here (feel free to suggest). To learn how get your map approved, you may check Requirements for map approval page. This page also contain some recommendations on how you can make your map better, even if you don't want your map to be approved or your map can't be approved due to it being created for single player mode orientation. Sometimes, when you test your map you might see some Errors. To avoid any type of Errors, we recommend testing your map from time to time during it's development. This way when your map has an error, it will stop working and you will know what the problem is and the problem could be connected with recent changes/additions made to the map. But still, Errors can occur sometimes. Feel free to ask on our forum about any questions or issues you might be experiencing and we will try to help you. Each time you ask for help on a certain Error please specify the: Map ID of the map that has the Error, Error code and LoadMap_StopAddress. Flash player plugin crashed - - Something unusual happends during loading or level execution, for example map requested too much RAM. This can happen when there is Lamp object(s) with high value of "power" parameter (we recommend values below 1). Players can't swim in Water area object - - Recreate the Water area object or resize it. It can happen due to negative size of Water area object. Game freezes or freezes partially - - It can happen when game tries to execute the Trigger that is contain an error of some sort in it's parameters. Map loads forever (or 15+ seconds) 1502 any The map was unable to load in the allowed period of time (15 seconds). Problem is connected with expensive calculations during map loading, for example: "shadows" in the map are calculations, global illumination calculations, snow generation, wall texture generation, too high "power" parameter of Lamp objects. Wrong parameter value on background object 2004 1309 Zoom out your map in Level Editor and then select everything with selection region. Then take a look at Objects list - there you might see objects which are not selected. Select them with click in Object list and manually change their position and size parameter values to correct ones or simply remove these objects. Note: This table mostly reflects only Level Editor v1.1 errors. If development was started at Level Editor v0.9 or you had copied some parts from map which development was started in Level Editor v0.9 - please look corresponding section for error solution in Level Editor v0.9 Manual.